At the very least I want to have both a male and female of each of the "Must Play" races and one of each profession (hmm, I suppose that makes all the professions "Must Play"...). Eight slots covers that. I could buy three more character slots for 800 gems each. 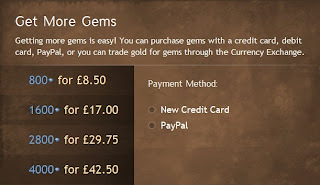 If I buy those for real money, that's £25.50. Or I could buy another standard copy of GW2 from Amazon for £34.00. For the equivalent additional price of just one further character slot, a second account would give me not four but five new characters, a second bank vault (worth 600 Gems, the cost of doubling bank space on an existing account) and the ability to mail items from anywhere in the world to characters that I own (otherwise unavailable at any cost). Since storage space is a serious and pressing issue in GW2 (this blog isn't called Inventory Full for nothing) and since Mrs Bhagpuss and I are already mailing each other items to hold in mail-storage for each other because we can't mail to our own characters, the advantages of buying a second account rather than expanding the existing one seem overwhelming. 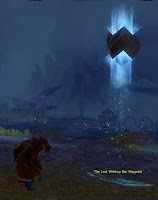 GW2 doesn't have an auto-follow command, so multi-boxing EQ2-style is out. It's also apparently not possible to log in two iterations of the client on the same PC. 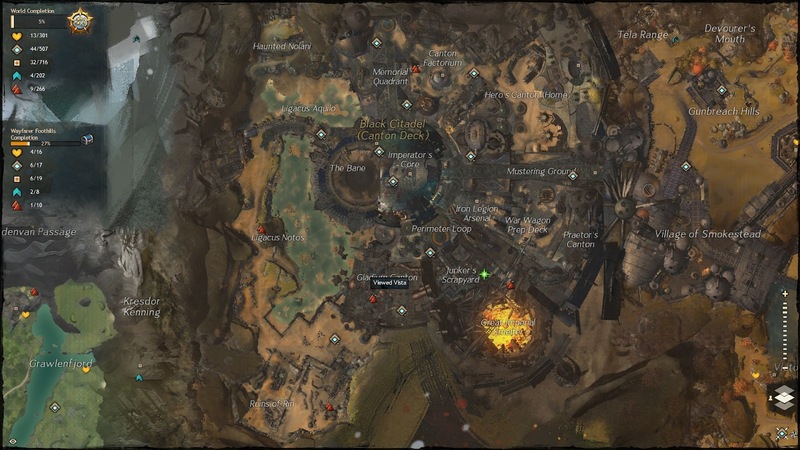 Technical issues aside, I'm nervous that doing either of those might constitute "botting" under ArenaNet's stringent interpretation of the concept so I wouldn't risk it even if there's a workaround. Logging in two accounts that I have bought and paid for, one on a laptop and the other on the desktop, however, seems to be entirely acceptable under the EULA, should I want to do so. Are there any reasons in favor of expanding a single account that outweigh those benefits? I can't think of any. Chances are I will buy a second account, and sooner rather than later. Some people are diligently filling out their hearts, finding every point of interest, viewing every vista, making certain nothing's missed before they leave a map (which is what we must now learn to call what we've known as zones for all of recorded history) and move on. I'm...not doing that. Last night in Gendarran Fields my ranger dinged 30. 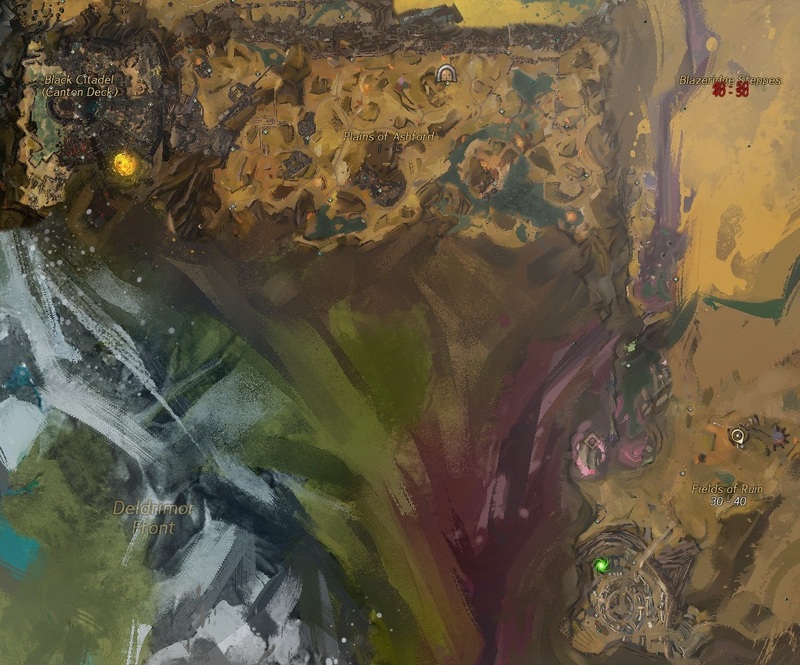 I opened the map to waypoint to somewhere and do something or other when I just happened to notice, way down in the bottom south-eastern corner, the faint white numbers "30-40". Must be an omen. All the other maps around my level are 25 - 35 but here's the Goldilocks zone. Hadn't I better go there right now and check it out? It was a plan with but one flaw: there didn't appear to be any rational way to get there. So far, every map in Tyria has been contiguous with another of the level below it, allowing a logical, natural progression. This appears to be about the only place where that's not happening. 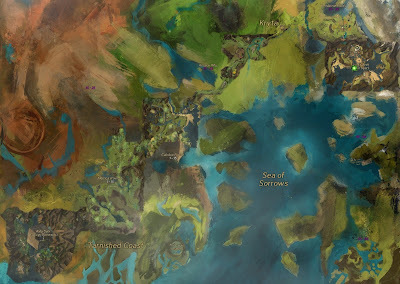 The map to the west is a non-map called Deldrimor Front, a place that exists in the world but not in the game. To the north-west it abuts the edge of Plains of Ashford, but there appears to be a solid mountain range between them. It seems the only possible access is from the north, through Blazeridge Steps, a map flagged 40-50. I couldn't see enough detail, really any detail, on the in-game map with its fog-of-war and pastel crayon styling so I turned to the invaluable interactive map at Guild Wars 2 Cartographers. Using that I could see all the connections clearly. I waypointed to Duskrend Overlook, the most westerly waypoint in Plains of Ashford and lo and behold, right next to it is a portal to Blazeridge Steps. How I ever missed it when I opened the waypoint I can't begin to imagine. 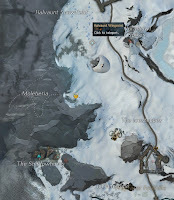 As is the way in Tyria, another waypoint stands just across the border. Unfortunately, it's the only one between me and where I wanted to go. My first run got me about half-way before some sort of air-strike painted a red circle around me and sent me in one hit back to The Last Whiskey Bar. (That's the name of the waypoint, not some cheesy metaphor for death, by the way). I dusted myself off for another run. This time I got 90% of the way, hugging the zone wall like the good old days in Kithicor. Unfortunately some devourers live on the far end of that wall and I dithered a moment too long before jinking to the left as I should have done. At this point it should have been back to the bar. I was, as usual, lying in the dirt contemplating the map and thinking along these very lines when the now-familiar words appeared on my screen: "A noble soul is trying to revive you". Much is being made of the social nature of GW2, how the game systems encourage and re-enforce co-operative behavior. It's all true. This particular good samaritan not only revived me, he revived me again when I died again about 5 seconds later and a third time when I died ten seconds after that, trying to make the lip of the ridge where I could drop down out of the devourer nest I'd fallen into. Like The Lone Ranger he didn't wait to be thanked, just did good and was gone. By the kindness of strangers I was able to stagger on without further fatality to reach the tunnel that took me from the deadly Blazeridge into the merely dangerous Fields of Ruin. Here the creatures only took three-quarters of my health and killed my faithful Wolf-Bear as I ran full-pelt for the signs of civilization I could see in the deep south. And what civilization! Not only is Fields of Ruin indeed a perfect place for a ranger just turned thirty, it's the hinterland of a full-scale city. 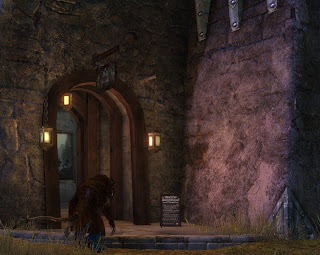 I was quite literally open-mouthed to find myself in the Stronghold of Ebonhawke, a fortified city of such size and detail as to dwarf the capital cities of most MMOs. 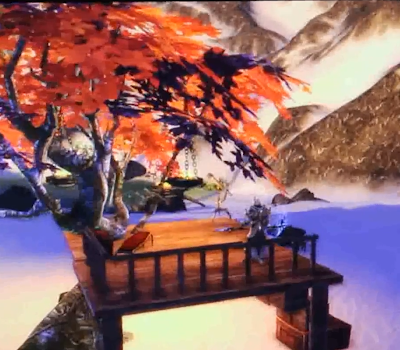 It's almost as though ArenaNet are showing off. 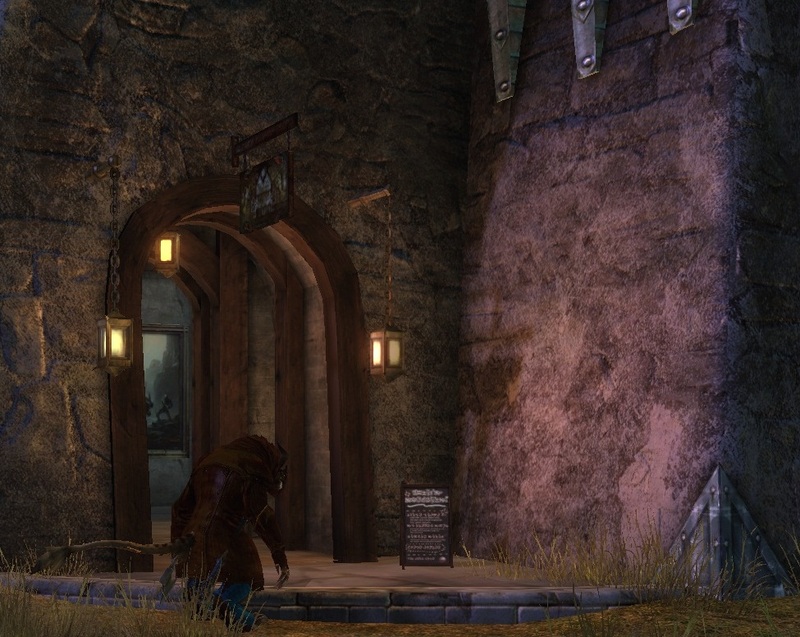 Oh, and what should I find inside the Stronghold but an Asura Gate. And where does that Asura Gate lead? Divinity's Reach. So that 30-40 map does have a level-appropriate access route after all. But where's the fun in that? 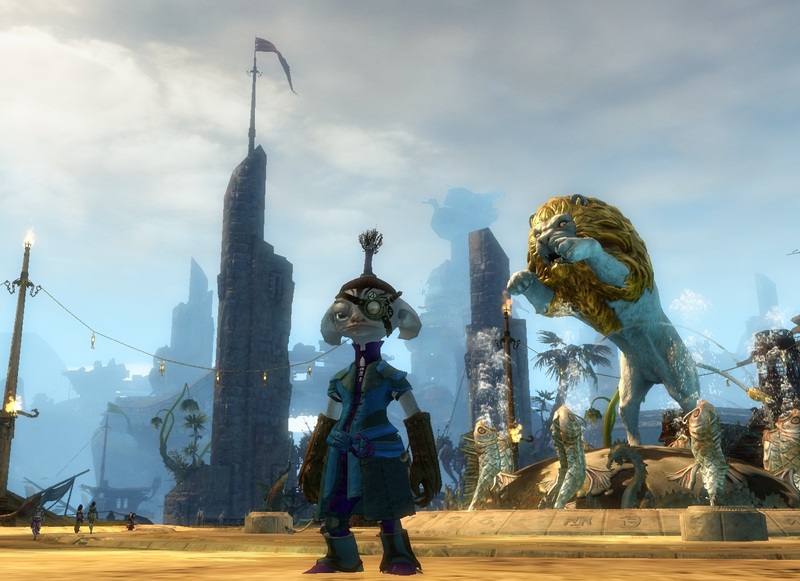 I made an Asura. I didn't mean to. It just happened. And went on happening. What I thought about the cabbage patch starting area? This wasn't that! I was level three when I left the Asuran heartlands of Metrica Province and running was such a joyous pleasure I didn't feel like stopping. So I didn't. 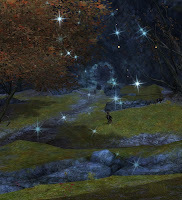 I ran through Caledon Forest, which wasn't too scary, then across Kessex Hills, which was. In Gendarran Fields I could see Lion's Arch, surreal on the horizon and there I was. I didn't know I was going until I went so I didn't begin filming until I was well on the journey. I kept to the road and only died twice, both times in Kessex Hills, once with the full screen map open and once when I was fiddling with FRAPS. After the first death I was lying there, still with the map open, cursing myself for missing the previous waypoint and wondering how far back I'd have to restart, when a kind passer-by revived me with the words I remember so well from so many other worlds - "Lol! What's a Level 3 doing here?". In truth, traveling in Tyria isn't that challenging for a young 'un. The roads are relatively, although by no means completely, safe and while predators can smell weakness from a mile away (read highly increased agro radius in areas where you have no business being) so far I haven't encountered anything that runs faster than I do. If you can get ahead of a wolf you can stay ahead of him until he loses interest. 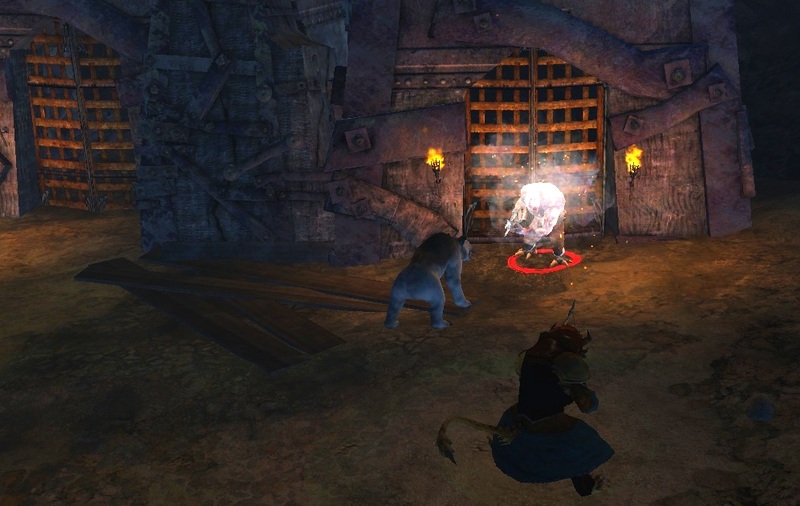 Of course, with Asura Gates in every town there's no need to run to Lion's Arch. Still and all, everyone should do it at least once. Just to say they've done it. "One must not put a loaded rifle on the stage if no one is thinking of firing it." Or in MMO terms, don't put in a ground-mounted cannon/laser-destructor/harpoon-gun, allow me operate, aim and fire it then give it nothing to hit but dirt. I'm looking at you, Warhammer Online. If you're going to do it, do it like this. (And yes, I did install FRAPS today and yes, I am learning how to use the YouTube account I've been neglecting for three years. So sue me). Animation. No, not Tom and Jerry nor yet UPA. The way your character moves. People do go on about it. Can't play because of how the barbarian's elbow sticks out when he swings his sword or the mage turns her toes in when she throws a fireball. I never really got that. I tend to spend more time looking at hotbars than at my characters when they are actually doing something and anyway there are usually so many explosions, special effects, spurting arteries, flying body-parts, huge numbers and speech-bubbles flying about it's all I can do to work out where my character is, let alone notice whether the articulation of his imaginary joints is authentic. Blase as I may be about the fine points of swordplay and finger-waggling, though I do take notice of how my characters run. 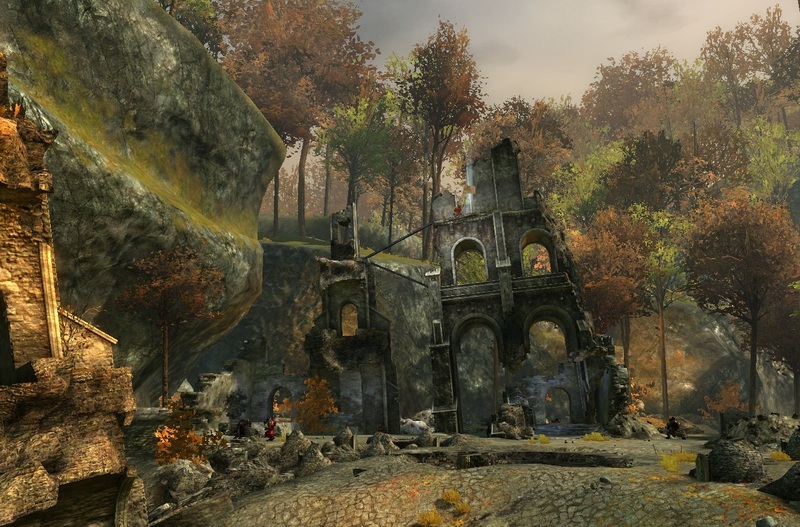 There's a lot of traveling in most MMOs, much of it done the hard way - on foot. Watching a half-elf hopping along like a hiker with a pebble in his Dr. Scholls or a dwarf rolling like a toddler with something he really doesn't want to tell you about going on back in the caboose can be distracting to say the least. YouTube in slightly better quality here. 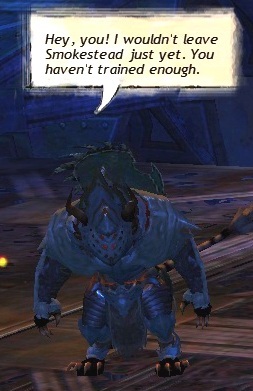 In GW2 I have the opposite problem. 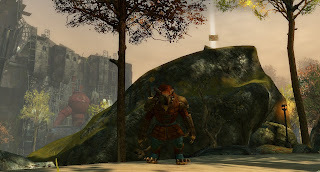 I could watch my Charr run for hours. 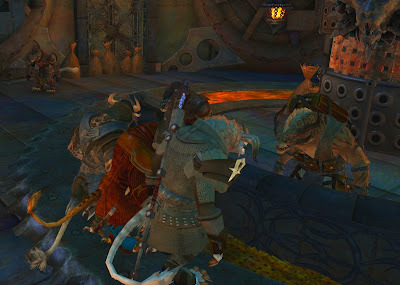 I do watch my Charr run for hours. It's one of the reasons I'm getting so little done. 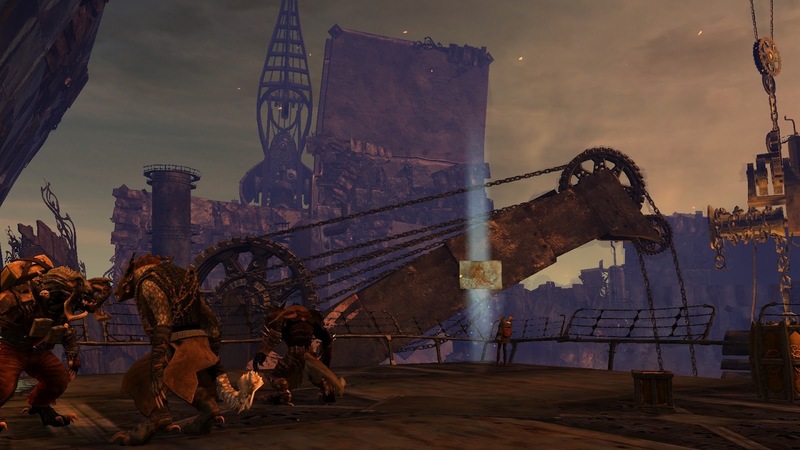 Off he goes on all fours, bounding across the iron platforms of the Black Citadel out into the eternal autumn of Ascalon. Beautiful, beautiful world. Beautiful, beautiful charr. Turn off the UI, turn up the sound and prowl. Listen to the pad of tiger feet on metal, in the dirt. Leave pawprints in the snow and hear the soft crunch fade. Be the cat. Other races are available. Why? Go-to pet for soloing so far? Definitely the bear. Soaks up the damage and holds agro like a wasp up a trouser-leg. 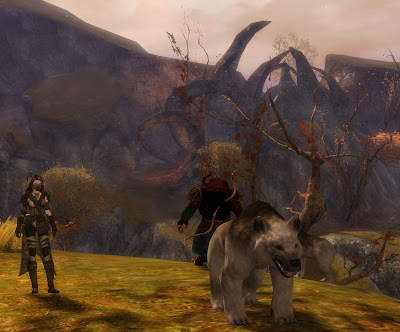 I started with a Black Bear that I ran across at Charr's Triumph in Plains of Ashford. 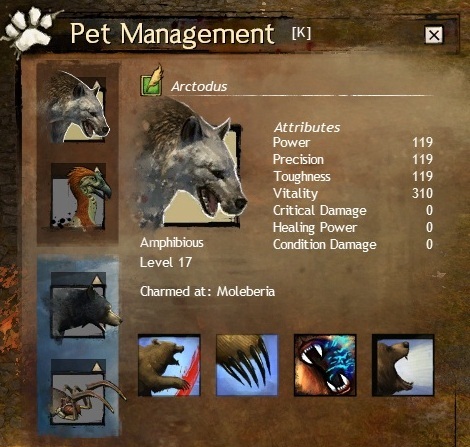 I know this because, with the attention to detail that we're already beginning to take for granted from GW2, the Pet Management window records exactly where you charmed each of the more than three dozen animals that you can currently collect. Pets, or Companion Animals as I believe they are known to Rangers who take their rangering a little more seriously than I do, come in Familes - Bear, Cat, Bird and so on. They also divide by Terrain - Terrestrial, Amphibious, Aquatic. (Amphibious pets aren't all frogs and newts, by the way. Actually, none of them are frogs and newts. They're land animals that can also swim underwater. They're amphibious like a duck. Or a DUKW ). All bears should have the same stats, which are derived (I know not how) from the Ranger him or herself. They differ only in that every animal has one unique ability. Other than if you need that specific ability, it shouldn't matter which bear you have. Oh, it does, though. You want the Arctodus. Well, maybe you don't but I do. I found him by chance in beta and he made a huge difference, probably mostly psychological. I'd forgotten him the way I seem to have forgotten almost everything I learned or did in beta but yesterday Mrs Bhagpuss found him the same way I did, by chance. Now we both have one. 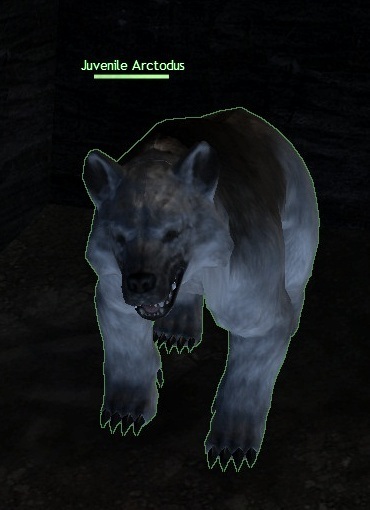 To tame a pet in Tyria you have to find a Juvenile. There may be juvenile arctoduses (Arctodi? Arctodopodes?) scattered far and wide but the ones I know are locked up by the dirty commie dredge in an underground pen in Moleberia. A bunch of miners are standing around outside hand-wringing about their imprisoned comrades. Captured by the Dredge and now they've stopped singing. I wasn't entirely clear if it was the dredge or the captive miners who'd gone silent but apparently lack of barbershop harmony is an ominous sign in the mining business either way. The ones who escaped are too scared of the dredge to go in and free their buddies but they're happy to sell you a tuning fork if you'll do it for them. That's just the kind of stand-up guys they are. Free the miners by all means but while you're down there don't miss out on a free Wolf-Bear. There's a Veteran Dredge standing directly in front of a locked door in the big cavern you enter right at the start. Burn him down and smash the door and you'll see several Juvenile Arctoduses (let's not go there again) milling around in a tiny cave. Bingo. There's a bear that will serve you loyally and look great while he's doing it. 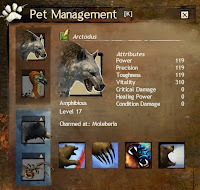 And unlike Beastlords in EQ2, where the appearance of each new type of animal in a family overwrites the existing one (boo, hiss! ), in GW2 you can keep all your bears for always! I didn't "do" any vistas in beta. All I knew about them going into Headstart was the very little I'd read. I had the impression they would be fiddly platforming mini-games and therefore not really my thing. I love 'em! They are nothing more nor less than pointers suggesting a few places you might like to go free-climbing in the way many have been doing since the earliest days of Everquest, and for all I know longer than that. 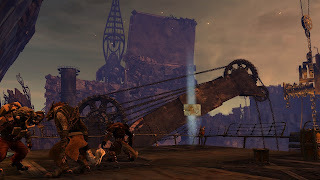 GW2 zone architecture isn't as clamberable as, say, Vanguard, but you can get to the top of a lot more things than you might imagine and just knowing it can be done is a great spur to giving it a go. 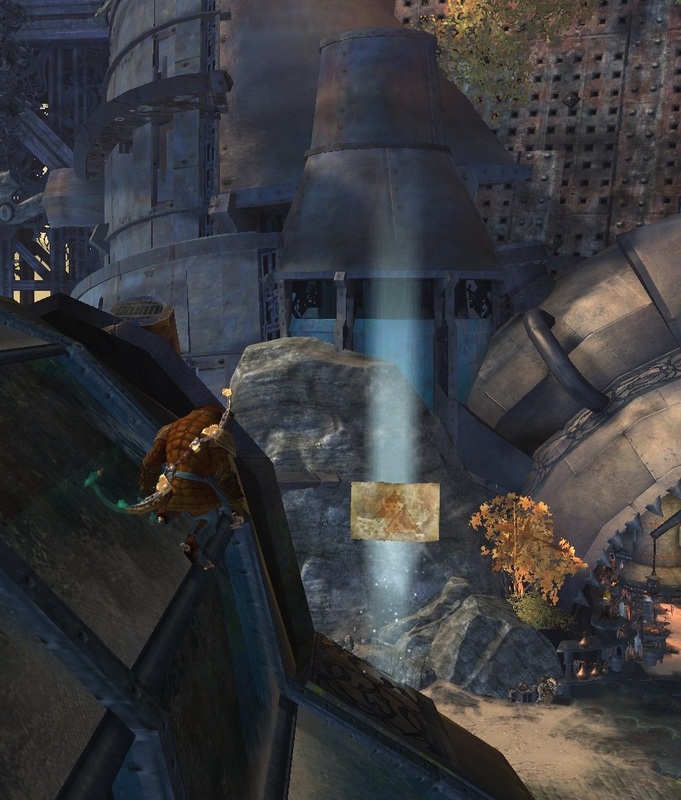 I did a fair amount of rock-climbing in beta before Vistas turned up because, well, you have to, don't you? What Vistas add is some structure and a nice way to record your climbs. 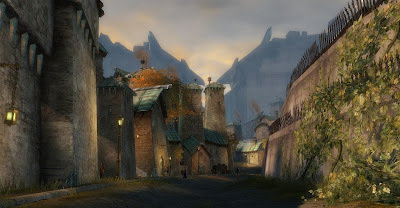 I'm not much of a completist but when I noticed that Black Citadel, the utterly wonderful Charr home city, has just the five I thought "even I can focus long enough to do that". So I did. And here's how. Easy as walking into a room. Because it's in a room. Not much of a view, unsurprisingly. Bring water. And asbestos soles. As easy as the first one, it's just up some walkways looking down on the biggest forge you ever saw. What are we building in there? I could tell you but then I'd have to...you know the rest. Actually between the Factorium crafting area and Memorial Quadrant where the magnificent statues immortalize our heroes. This one looks tough if you try to climb up from below, as I watched a silly human trying and failing to do. It's simple if you just walk up the ramp above it and drop down onto the glass roof. 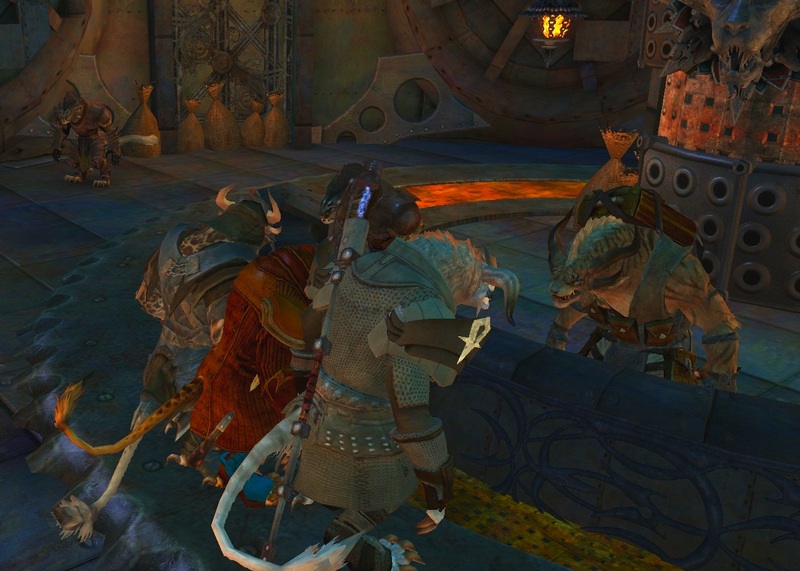 Don't worry, if it can take a Charr's weight it'll take yours. Probably. 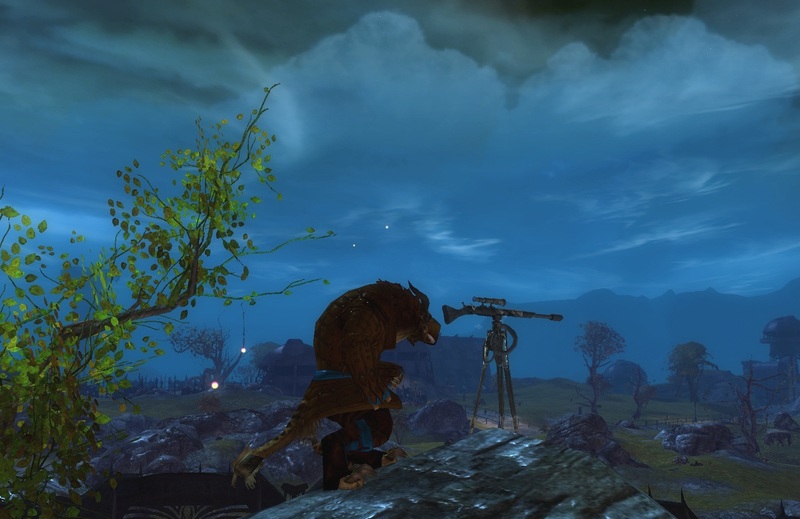 Great view of the Charr Deathstar from this one. First one that requires some actual climbing. Just a few hops up a smallish rock. Nice spot for a picnic at the top and a really lovely view of some bits of Ascalon we didn't knock down when we improved it. The only real climb of the five and one that looks extremely intimidating from below. Very high on a ruined wall that looks like a gust of wind might bring it down. Or a light breeze, come to think of it. Ignore the side that looks like convenient steps - they go nowhere. Go up the other side , round the corner, along the ledge then up the two girders. I did it first try - it's much easier than it looks. There you have it. Five easy Vistas to get you started. Get your hobnails on and get clambering! 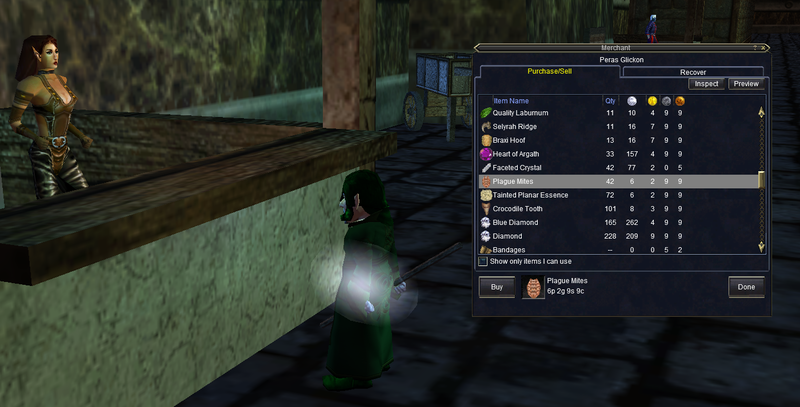 EQ2Wire has a typically excellent account of the latest development in the PSS1 saga. In the light of the many issues that have arisen during and since the transition of DCUO from SOE's stewardship to our putative PSS1 overlords, the conversion of EQ2, which was due around about now, has been postponed. As I commented on the EQ2 board, and Brasse was kind enough to acknowledge the validity of the point, there’s very little benefit in PSS1 going to an event in America in order to address the concerns of the affected players who by definition under this deal live in Europe! I’ve no doubt that the EQ2 transition has been delayed because SOE have concerns over some of the problems they encountered in the DCUO transition, not because there are unresolved concerns that the players have. I haven’t seen any commitment not to make the transition until the players’ concerns have been fully resolved and I doubt they ever will be. Players want choice. They want the new players who PSS1 recruit to have to sign up with them while existing players have the choice whether to do so or to stay with SOE until they can see that PSS1 are an equal company to SOE to hold an account with. If the companies truly believe they can in time bring those players on side then it must be better to keep them with SOE in the meantime rather than lose them to the company’s games now and for all time, which is how it’s looking for a lot of long-term players at the moment. Recruiting a lot of new F2P players taking a non-committal look at the game is naturally a good thing, but so too is hanging onto a lot of established players who have for the most part subscribed to the games over many years thereby demonstrating a long-term commitment to them. That’s what SOE don’t seem to be able to get a grasp of at the moment. Seconded. And a fine summation of where we are now and where we should be going, Seffrid. I am not rabidly anti-PSS1. I already have a PSS1 account, or rather I have an Allaplaya account. When I can fit in a session or two I play one of their games, Argo. It’s an enjoyable F2P title. That does not mean I want to give up more than a dozen years of history with SoE. Much less does it mean I’m happy to be sold on like a bad debt. 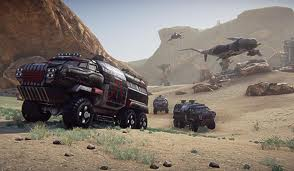 A deal whereby PSS1 marketed SOE games in their territory and signed up all the new members that marketing brought them to their own financial benefit would not just have been accepted by the UK/EU players, it would almost certainly have been welcomed. This could have been a PR triumph instead of a PR disaster. If any of these decisions really are within the remit of SOE, something I have always doubted, it’s still not too late to do this right. I suspect, however, that all meaningful decision-making on this takes place somewhere above Smed’s pay-grade and at that level we really are all just numbers. 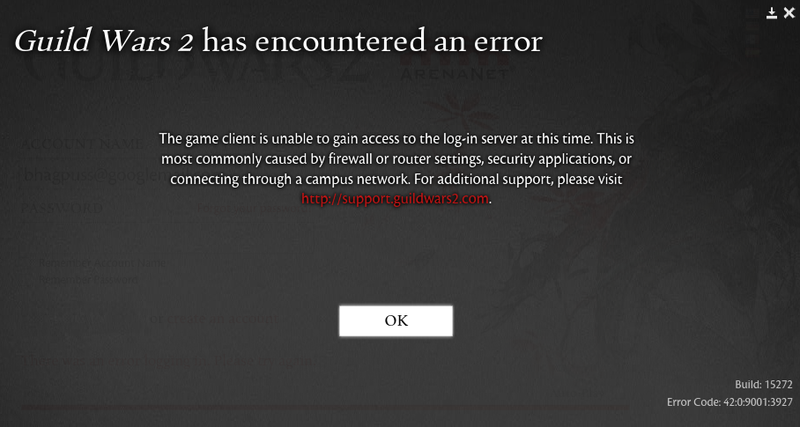 And now I'm off to play GW2 (assuming the servers are up). SOE have a lot of competition on their hands right now. My issue is more likely to be when I get time time to play their MMOs in future. They really don't need to be putting barriers in the way of me giving them my time or my money, now do they? Wake up around 7.30am. *** Make cup of tea, butter some toast while PC gets itself sorted. 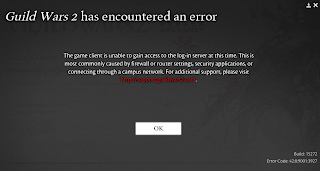 *** Click little red dragon to see if servers came up early. If so, log in. If not, wait for scheduled start at 8 am. *** Log in my account and make a Charr Ranger on Yak's Bend. *** Log in Mrs Bhagpuss's account since she'll already have left for work and can't do it herself. *** Make two placeholder characters on Yak's Bend for her, to reserve the names she wants. *** Stop being her, go back to being me. *** Make guild. *** Play 'til I pass out. 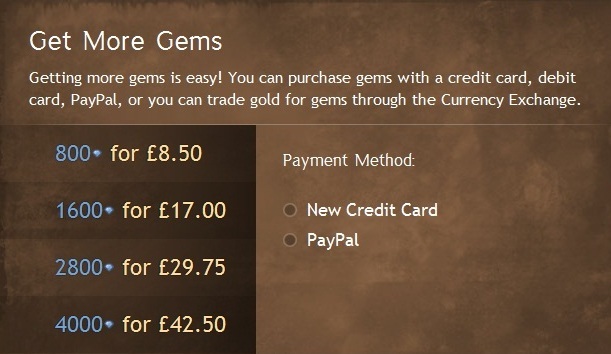 Look in Gem Store for server move options. Can't find any. *** Tab out and google "GW2 Server Moves" and find it's an option from Character Select *** Log out to Character Select, find the button, see that all the US servers that were "Full" are now just "High". *** Move all characters to Yak's Bend. *** Heave sigh of relief. Hence this post. If I could be playing I would be playing. Ah well, could be worse. We're on the right server, 50% of the names wanted were available (okay, just the one name but it sounds more impressive as a percentage) and I got to play for nearly three hours. For day one of a headstart that's well above par. Time for lunch. Let's hope I'm not back here later on today. I do apologize. I came across the following video on a blog I don't usually read, which was linked from a blog on my blog roll. Unfortunately, I can't for the life of me remember either of them. If it was you (either you) consider yourself credited! And heartily thanked. If not for that I might never have seen it. This rather ropey video single-handedly shoved Rift's Storm Legion expansion up the Team Bhagpuss must-buy list from "mmmm, maybe" to "hell, yeah!" so I thought I'd mention it here to spread the word. Despite the stereotypically humorless German fan heckling out of shot, the abominable camera-work and the aimless faffing of whoever's actually playing the character, isn't that just fricking awesome? My main complaint about Rift, a game for which I generally have a great deal of time, has always been that there just isn't enough to do that's not fighting stuff. Now there will be. In spades. 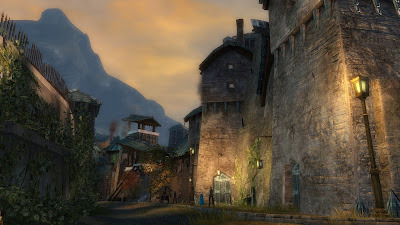 With Rift and WildStar hopping on the housing bandwagon in style, EQ2 might finally have competition in the field it's made its own. I wonder who else might throw a hat into this particular ring? 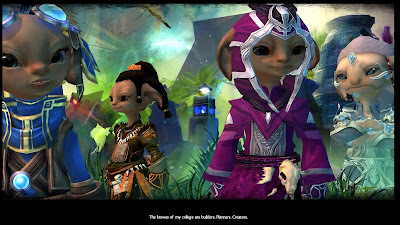 What with all this and Neverwinter too, I have to say I do like the way this is all heading. This is a blog not a news site but since I got started on the whole SOE/PSS1 thing I may as well carry on. BBC Technology News (which is more than half-decent at picking up game-related stories) had a piece about the closure of Sony's game development studio in Liverpool, England. I'd completely forgotten that Sony even had a games studio in the UK but on reading the piece it came somewhat vaguely back to me that there'd been a bit of a fuss a long, long time ago, when Psygnosis, an independent studio that was very well-known indeed in UK gaming circles, was gobbled up by the big, bad multinational. 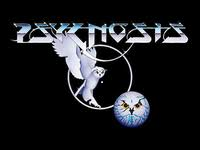 I never played many Psygnosis games back in my ZXSpectrum and Amiga days. All that Roger Dean artwork seemed more than a tad embarrassing in the 1980s although it looks quite sweet now. I did play Lemmings, of course. Everyone played Lemmings. It was the Angry Birds of its day. "...it was felt that by focusing our investment plans on other studios that are currently working on exciting new projects, we would be in a stronger position to offer the best possible content for our consumers." It would be nice, wouldn't it, to think that one of those "other studios" working on "exciting new projects" might be SOE. They are, after all, working on both Planetside2 and EQNext. Smed also occasionally drops hints about other projects even more secret than EQNext, which is rumored to be being developed for reasons of security in a secret base somewhere beneath an active volcano. It would be nice, but as Scott Jennings likes to point out, there are reasons why we can't have nice things. Wilhelm at TAGN , replying to a comment of mine, makes the astute observation that Sony have a record of being mostly interested in selling hardware. They are, at heart, a consumer electronics firm, after all. Sony don't make desktop PCs. They do still make laptops and a strange hybrid tv-pc that I wouldn't kick out of the living room but to what extent this marries with the MMO market I wouldn't care to guess. MMOs are still, primarily, a desktop PC hobby. There have been a few console MMOs and there are a few more on the way but it could hardly be considered the heart of the market. Desktop PCs themselves are almost certainly living on borrowed time and consoles may predecease them. 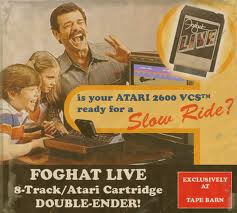 Before very long the combined onslaught of tablets, smart-phones and internet tv could (I would bet on "will") send both dedicated gaming PCs and consoles to the same "remember when" rose-tinted graveyard as VCRs and 8-Track Stereos. It's possible SOE could be a big part of that transition should it occur, providing MMO-style content for new platforms. I could live with that. You have to wonder, though, whether MMOs are the type of content those new platforms will want to have provided for them. On the thread relating to the PSS1 acquisitions on the Everquest forums someone suggested they "strongly suspect that the real situation is that SOE are in the process of being sold (by Sony) to PSS, and this is the due diligence period." I'm not sure I buy that conspiracy theory in whole cloth but I probably wouldn't faint if it turned out to be true. If it's not PSS1 it may be someone like them. That's if Sony don't just decide to call quits on the whole thing, like they did in Liverpool today. Who knows, we might even end up being glad PSS1 took an interest after all. Check who else chose the same server. Think of a better name. Think of a good name. Go look at some books by writers who are good at names. Steal one. 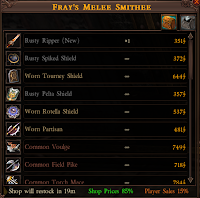 Check what tradeskill Mrs Bhagpuss chose. Have an argument over who should do which tradeskill. Buy enough Diet Coke, coffee and red wine for least three days. And food! Don't forget food! Try to remember name of server. Go back to website. Write it down this time. Do not start planning a second character. No, really. Not even if it's an Asuran Engineer. Decide on preferred variant spelling of own guild name. Write down exact spelling of own guild name and tape to monitor. Put fresh battery in alarm clock. Go to bed. Oh, go on then, one more patch! 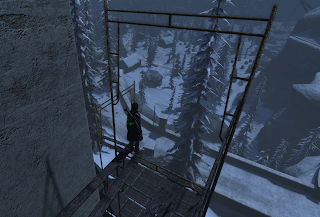 I finally hit the wall in The Secret World. I ran full-pelt into it about half-way through Carpathian Teeth, the final overland zone. Until then I'd dealt with anything that gave me trouble by over-gearing. 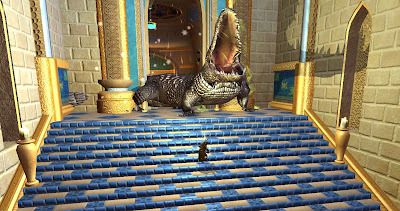 When Blue Mountain asked more of me than I was prepared to give I went to Egypt and used some techniques seldom employed since the glory days of Everquest to shift my average quality level from 4/5 to 6/7. I found Missions that didn't ask me to kill anything. I experimented to find out which mobs I could already manage with the gear I had, then farmed them for the upgrades they dropped. 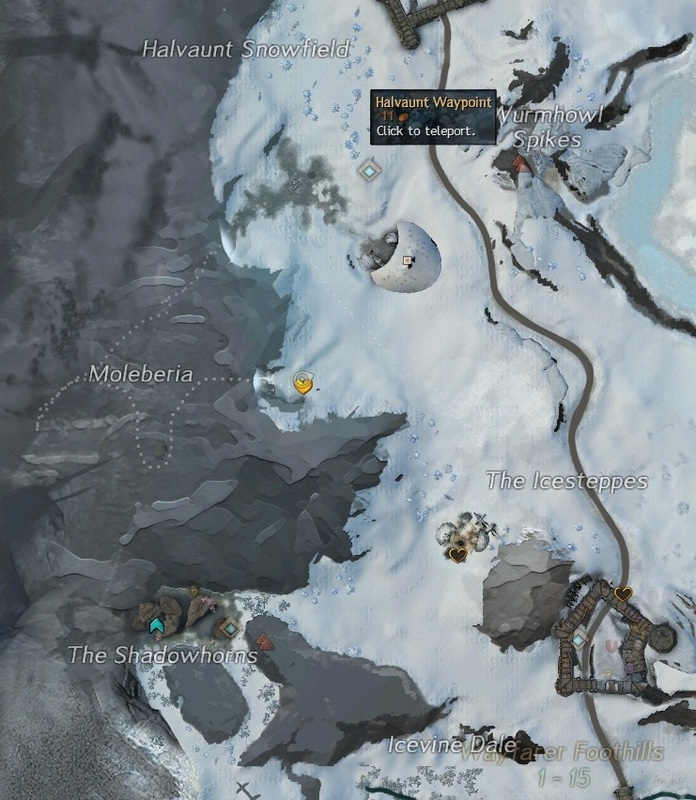 I found spots where I could pull the mobs I couldn't solo to guards who would help but leave me with the credit and the loot. Long before I was anywhere near finished with Egypt I was visiting the lower reaches of Transylvania trying the same tricks to gear myself up still further. I dabbed back and forth between the two for several weeks until one day I realized I was dressed almost entirely in Q10. Top of the shop. Q10 green, that is. Not good enough. Deep into Transylvania the mobs come thick with health and packed with tricks. I can can kill them but there's no fun in it. Different builds helped some but nowhere near enough. I need better gear and that means Blues. 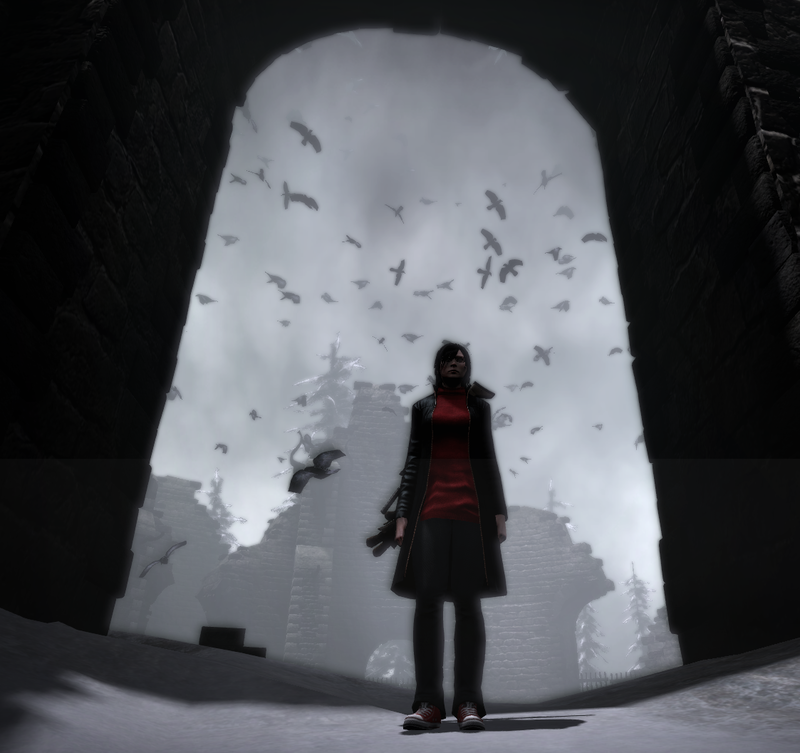 That's the poorly-kept secret in the The Secret World: for all the ballyhoo about bringing the thinking back, for all the immersion, atmosphere and aesthetics, for all the great stories, voice acting, cut scenes, even for the ever-whirling wheel of skills, in the end it all comes down to gear. Dungeons come in three flavors: Normal, Elite and Nightmare. Normal and Elite dungeon bosses and sub-bosses (Nameds, as I still like to call them) drop specific Blue quality items. 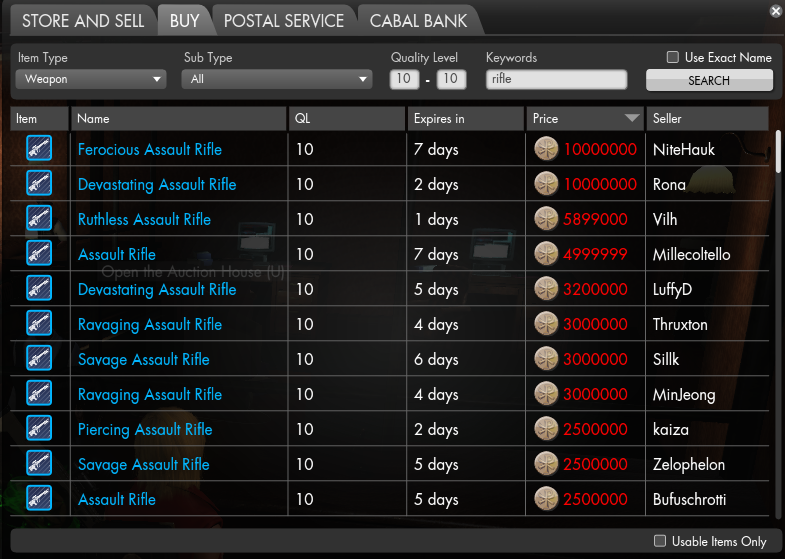 TSW Loot has a handy searchable database. Nightmare Nameds drop Purples but we don't need to worry our pretty little heads about those yet. Or ever. Since the drops are boss-specific it's the old run a dungeon back-to-back until the thing you want drops and you win the roll. 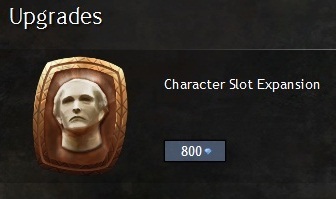 With TSW's classless skill system, anyone could potentially "need" anything so good luck with that! PvP gets you White and Black Marks of Venice which can be spent at vendors in your faction headquarters for both Blue and Purple gear. You need a lot of them. The playerbase took about half a nano-second to realize that the most efficient way to do this would be for each faction to follow the others around The Fusang Project capping mission objectives in a formal dance. That gets you seven Black Marks of Venice every 30 minutes and the dance never ends. KIASA runs you through the dance-steps here. It's more amusing to read about than it is to do. CoV Sequins come from doing missions. This is the easiest way to get blue gear so naturally the best you can get doing it is Blue Q9 and then not for all slots. The highest weapon is Blue Q8 and I'm still using it. Crafting can, in theory, get you very nice Blue gear. What's more, you get to pick your own stats. It sounds ideal but there's a but. Each item you craft requires a Toolkit of the appropriate type and said Toolkit is consumed on use. Toolkits are mainly found as dropped loot from mobs. The quality of the Toolkit dictates both the Quality Level and color of the item you craft, so if you want a Q10 Rifle (guess who wants one of those) you need a Blue Q10 Weapon Toolkit. You can guess how often those drop. No, guess again, you guessed too high. Waaaay too high. Luck features in the crafting option but like the cheese it also stands alone. There are random Blue drops at all Quality levels. I had a couple in New England but none since. The chance of one dropping and it being something you'd use really don't bear thinking about. Sanity check required. Auction House Ah, we all end up here in the end. I presume in theory anything could turn up on the A.H. but as I write there's not a single Q10 Talisman on sale that isn't green. Plenty of blue weapons, though. At a price. So, however you mix and match it, you'll have to take your portion of grind. Grinding through the same dungeons, grinding round Fusang Projects, grinding repeat missions, grinding mass slaughter or grinding wealth. The degree of grind isn't unreasonable or unrealistic but much though I like grind when it's of my choosing, this isn't the kind of grind I'm looking for. I've thoroughly enjoyed my time in The Secret World. There's no doubt I'll be back for more. For now, though, I'm done. Playing, that is. Can't promise I won't have more to say. 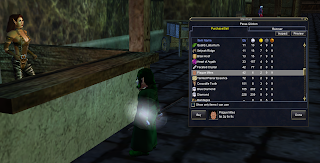 I miss Everquest's vendor diving. It was an entire game in itself. If you're looking for sandbox gameplay and emergent behavior, look no further. Was there any other MMO that had it? 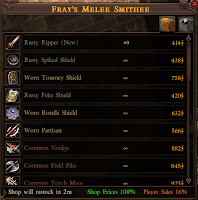 For anyone unfortunate enough to have missed out on this most excellent of MMO pastimes, vendor diving is what happens when NPC vendors don't just pay good coin from their infinite funds for your rat ears and rusty daggers, they put those same ears and daggers back up for sale. These they price according to some arcane system of their own devising. Mmm Mites. And plaguey too. The fun occurs when their prices fall wildly out of kilter with what a player might call "the going rate". Many were the amazing bargains to be found by a diligent diver. 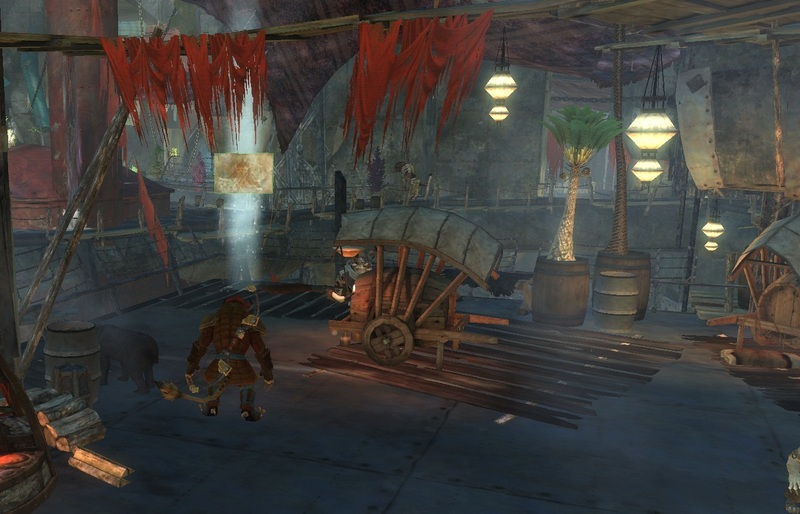 An item that passed from hand to hand for thousands of platinum pieces in the EC Tunnel or, later, in Luclin's Bazaar might turn up on a vendor in some out of the way location marked down to a few gold, waiting to be snaffled by some lucky passer-by or picked up in a scouring exercise by a player who made a practice of searching for just such an opportunity. 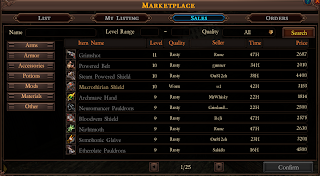 With a crafting system built around the acquisition and consumption of huge quantities of raw materials almost entirely obtained from killing and looting creatures, even the most innocuous and uninteresting body part could fetch hundreds of times its nominal value when sold back to a player desperate to raise his skill in baking or tailoring. 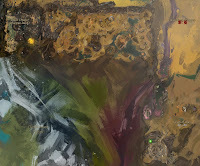 An hour spent judiciously searching the scores of vendors in Qeynos or Freeport or, later, Plane of Knowledge could net enough wealth for a savvy new character to bootstrap herself into twinkdom. I used to make characters on servers where I'd never played for the sheer fun of doing exactly that. Start at the left and go round. See you back here in two hours. 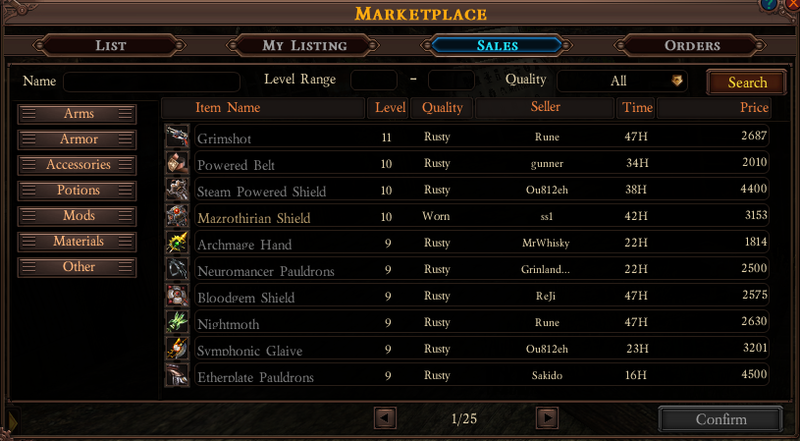 Every server reboot, patch or simple zone crash reset all vendor stock so the bargains just kept coming. After a patch the Planes of Knowledge and Tranquility resembled meadowland on a sunny spring day as flocks of players flitted from vendor to vendor like bees from flower to flower, if bees were greedy, grabby gnomes and flowers rapidly filled up with discarded detritus amongst which might shine the occasional diamond. Perhaps seagulls on a council tip might be a better analogy. Add to this already rich field of enterprise a whole substrata of complexity including prices that varied by faction, charisma and location. Observe that vendors chose not to display everything they had to sell, keeping some of it out of sight in some notional store-room from which they could be induced to restock if you bought them out of something else. 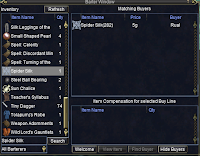 Mix in Barter, whereby players could automate their buying through the Luclin Bazaar, creating a ready market for many commodities and rare items that functioned as de facto player-created quest generator. With all this, Everquest's multifaceted economy was at one time arguably a bigger, more complex and certainly more strategic game than the adventuring game which, Tardis-like, contained it. No subsequent MMO has ever come close to matching it in this respect, something for which I was once obscurely grateful, having been driven close to exhaustion by the sheer overwhelming task of keeping up with the possibilities day after day. That was long ago, though, and I now I miss it. I eagerly scour the supply chain of every new MMO for something that recalls, if only mildly, that glorious edifice of enterprise. 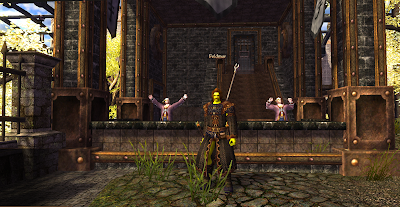 Ryzom has a neat trick of using NPC vendors as salesmen for player-made goods. Guild Wars has a bourse system for collectibles, dyes and crafting materials. 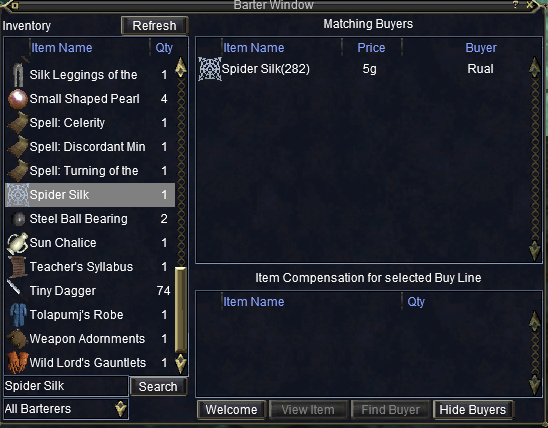 FFXI has a fascinating Blind Auction mechanic. WoW and Rift each have wandering vendors who have to be found before they'll sell you their special goods. And then there's City of Steam. 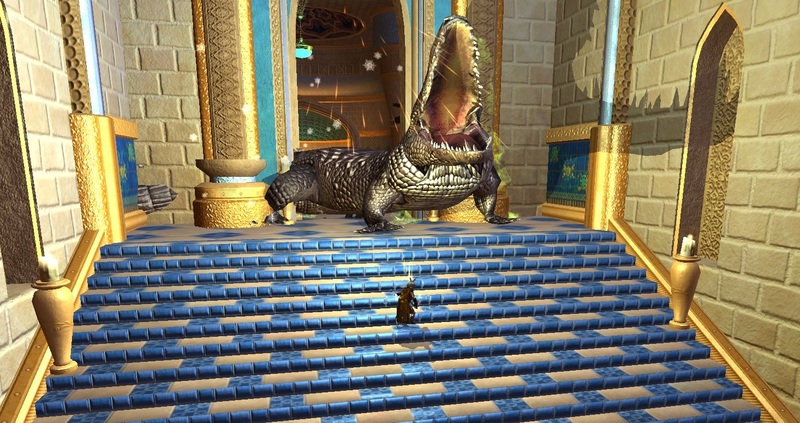 At first I thought I'd found in City of Steam the game that would bring back diving. 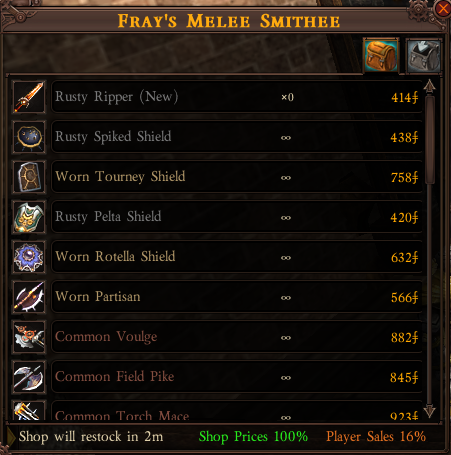 Unfamiliar as I was with the items and the processes, it seemed to me for a while that I could see my loot re-appearing on vendors after I sold it. Sadly, I was wrong. City of Steam does nevertheless have an interesting and complex system of its own that could develop into something compelling. Here I must issue a caveat: not only is this still alpha and anything could change, but I don't claim to clearly understand the system as it stands. I posted on the forums for clarification but apart from one helpful reply I learned little. This, then, is the system as-seen. I stand more than open to correction. This is a timer displayed in minutes until the last minute, when it displays in seconds. I think the full duration is a standard 18 minutes but there may be variance. It tells you how long the shop will display its current list of goods. The display timer doesn't tick down (I would like to think it will by the time the game goes Live) so you have to open and close the window to see it progress. If you do so you will see that it proceeds in real time. At the top of the list of items for sale are several "unique" items. That's to say items that the vendor only has one of to sell, this time around. When someone buys one, it's gone until the shop restocks. When that happens, however, the same item is not guaranteed to re-appear. A different one-time item could take its place. 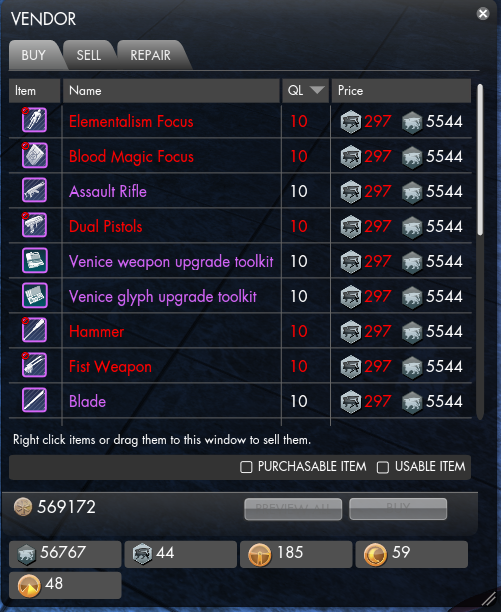 Most of the items vendors sell are available in infinite quantities. I think the little loop symbol next to them is actually the infinity sign although it's too small to be sure. 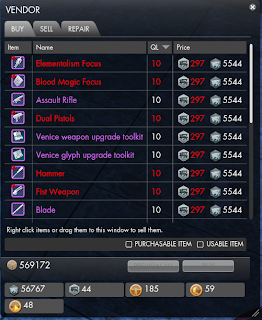 As well as the unique items, some shops also have other items limited by quantity - 10, 15, 20 etc. As the timer ticks down the shop could go out of stock of these but I think it will always restock them in the next round. This is a percentage. It appears to represent the current discount offered by that particular vendor. If it says 85% then an item with a base price of 1,000 shillings would be on offer for 850 shillings. This percentage varies throughout the duration of each Restock. I have no idea what causes it to change. This is also a percentage. 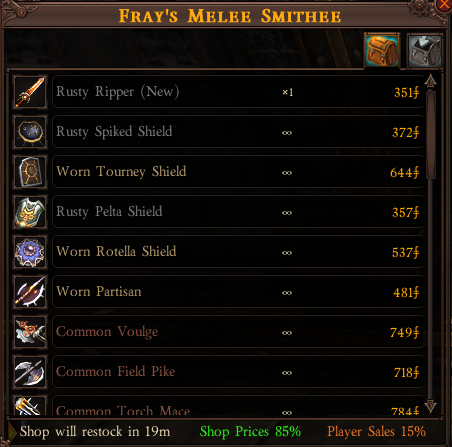 It appears to tell you how much you can expect to get for the items you sell, in relative terms. If Player Sales is showing as 19% and you sell the vendor an item for which his base price would be 1000 shillings he will pay you 190 shillings for it. This percentage also varies and again I have no idea what drives the changes. All three of these variables appear to be discrete to each vendor, which opens up a potentially massive area of economic metagaming wherein knowing which vendor to sell what to when could make a huge difference in your income. Whether managing or even micromanaging vendor sales becomes a routine part of gameplay, a niche hobby or has no take-up at all will depend a lot on how crucial wealth is to gameplay, something that can never be predicted in any game until it goes Live. 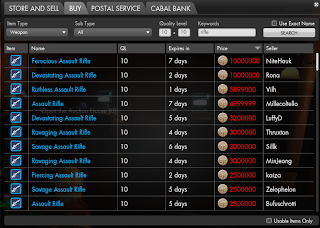 Oh, and there's also a fully functioning Broker system for players to buy from and sell to each other. It has all this in alpha. And it all works. Both the imaginative scope and the attention to detail in every aspect of City of Steam are impeccable and the level of ambition is astonishing. I hope they have as clear an understanding of how to generate real wealth from the game as they evidently have of how we should generate imaginary wealth within it, because this is one game I would like to see not just survive but prosper. It Ain't Like It Used To Be; But It'll Do.